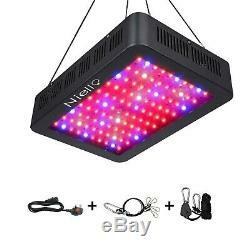 600W LED Grow Light, Premium Double Chips Full Spectrum Plant Grow Lamp, LED Hydroponic Light for Indoor Plants, Veg and Flower with UV IR Daisy Chain. Wattage:600.0 Watts Why choose our plant growth Lamp? We have professional teams of engineers with mature technology. Our products are manufactured in our own production room to keep prices low. 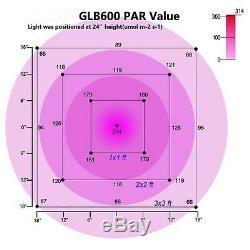 All LED growth lights are CE and ROHS tested, safe and trustworthy. New 10W double chips technology, more brighter than 3W and 5W chips LED. Double Chips and Full Spectrum- provide plants vegetable and flower all stages with everything they need in the natural sunlight. Technical specifications: · Product size: 32cmx 22cm x 6.5cm · Product weight: 2.4 kg · Replaces 450W HPS / MH · Average energy consumption: 125 watts · LED Quantities: 60pcs 10Watt Bridgelux/Epileds · Input voltage: AC100-240Volt · Frequency: 50-60Hz · LED Angle: 90/120 degree mixed · Distance to the plant: 0.5-1m · Maximum illumination in 60 cm height is100 x 100 cm · Core lighting in 60 cm height is 90 x 90 cm · Lifetime:> 50000 hours. Warm tips · The light is NOT waterproof, and can only be used indoors. · The IR (infrared) diodes are dark. 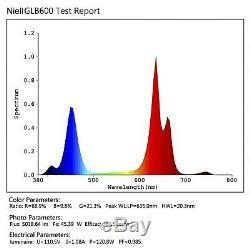 This is normal because infrared light can not be perceived by the human eye. · No additional ballast required. 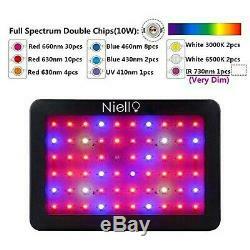 High Power Double Chips DesignDesign with 60pcs 10watt super bright double chips LEDs, 90/120 degree mixed LED angle, higher PAR/Lumen output per watt than others, better for hydroponics greenhouse indoor plants growing. 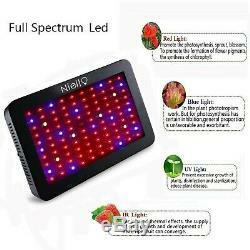 Advanced Full Spectrum400-760nm full spectrum include red/ blue/ white/ orange/ yellow/ uv/ ir spectrum, special ratios of blue, red and white suitable vegetable and flower for all growth stage. UV sterilization, kill bacteria that seriously affect plants bloom and grow, IR promote cell division and flowering and vegetable stage yield increase to a certain extent. Stronger Heat DissipationBuild with new upgraded 0603 aluminum cooling heat sink + 2 pieces of fans form a cooling system, which can effectively dissipate heat out and ensure that the plant grow light can work normally. 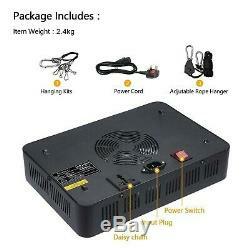 High Efficiency and Energy Saving450W HPS/MH replacement while consuming only 120W! Perfect for 3x3ft growing area at 24 height (Max coverage 3.5x3.5ft). 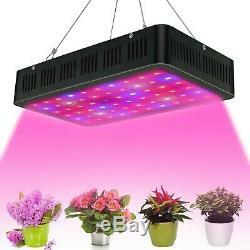 More than 80% of the light from the LED plant light can be absorbed by plants. Compared with the tradition lamp, it can save 80% of the electricity. Unique Fault Self-test SystemEach lamp beads is equipped with a Zener diode. If one is not lit, it will not affect the normal use of other lamp beads. Item Weight: 2.97 Kg. Package Dimensions: 37.3 x 30.7 x 12.4 cm. Date First Available: 12 Oct. For orders of more than 3 please message us because we have many more in stock. And we will work with you to resolve it to your satisfaction. If you have any questions regarding the product please message us and we'll be more than happy to help. The item "600W LED Grow Light, Premium Double Chips Full Spectrum Plant Grow Lamp, LED" is in sale since Friday, March 1, 2019. 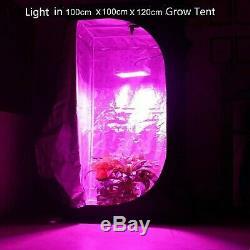 This item is in the category "Garden & Patio\Hydroponics & Seed Starting\Grow Light Kits". The seller is "sehgieh" and is located in Bury St Edmunds. This item can be shipped to United Kingdom, Austria, Belgium, Bulgaria, Croatia, Cyprus, Czech republic, Denmark, Estonia, Finland, France, Germany, Greece, Hungary, Ireland, Italy, Latvia, Lithuania, Luxembourg, Malta, Netherlands, Poland, Portugal, Romania, Slovakia, Slovenia, Spain, Sweden, Australia, United States, Canada, Brazil, Japan, New Zealand, China, Israel, Hong Kong, Norway, Indonesia, Malaysia, Mexico, Singapore, South Korea, Switzerland, Taiwan, Thailand, Saudi arabia, South africa, United arab emirates, Ukraine, Chile, Antigua and barbuda, Bangladesh, Belize, Bermuda, Bolivia, Barbados, Brunei darussalam, Cayman islands, Dominica, Ecuador, Egypt, Guernsey, Gibraltar, Guadeloupe, Grenada, French guiana, Iceland, Jersey, Jordan, Cambodia, Saint kitts and nevis, Saint lucia, Liechtenstein, Sri lanka, Macao, Monaco, Maldives, Montserrat, Martinique, Nicaragua, Oman, Pakistan, Peru, Paraguay, Reunion, Turks and caicos islands, Aruba.